Sony Ericsson launches its new touch screen slider phone, The Aino. Sony Ericsson Aino flaunts a wide 3-inch touchscreen display which is capable of showing upto 16 million colors with 240:432 resolution. This amazing phone measures 104 x 50 x 15.5 mm in dimension and weighs 134 grams only. 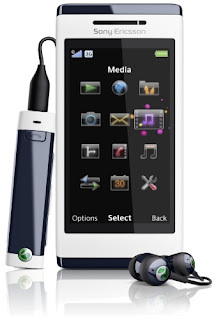 Sony Ericsson Aino will be available in two distinctive colors – Luminous White and Obsidian Black. The new Sony Ericsson Aino is the first phone with Remote Play feature that enables the user to remotely control their PS3 over Wi-Fi or anywhere through Internet. On connectivity side this stylish phone supports Bluetooth technology, USB support, Wi-Fi that facilitates wireless internet connection GPS, GPRS, EDGE and tri-band HSDPA. It is also DLNA Certified which facilitates wireless connection to any other devices. Sony Ericsson Aino has a whooping 8 megapixel camera that comes with features like Red-Eye correction, Image stabilizer that avoids blurriness caused by slight hand movements, BestPic which takes 9 shots of a picture in a second, Face detection, video recording at 30 fps and Auto focus. Sony Ericsson Aino has an excellent battery life with an estimated 15 days Standby time along with talk time of 3 hours. This powerful phone can support memory up to 16 GB (expanded memory). Sony Ericsson Aino also supports applications like Facebook and You Tube for nonstop entertainment. This smart phone has Sony’s Clear Bass and Stereo Sound enhancement technologies that give the user a good sound quality. This elegant smart phone has got all well-know goodies. We now no longer have to choose between a Walkman and Cyber-shot.